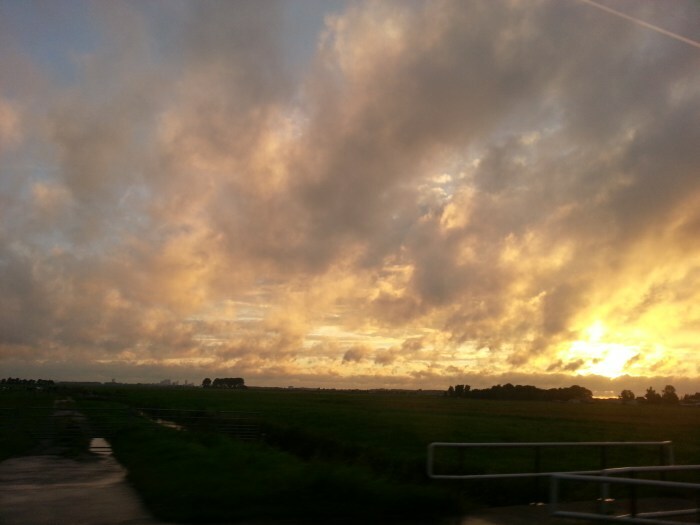 Even though I'm not really a fan of busses, I do enjoy the views and skies during my regular busride through the polder between Zoetermeer and Leiden. Danja and I visited Blijdorp Zoo as an early birthday celebration/present for her. We hadn't been there in years, it was fun to be back! Bram and I checked out Pop Up Leiden at the old V&D store. Small businesses have set up temporary shops in there. The photo below shows the gallery corner (with work from our friend Abcarius ART, amongst others!) and one of the seeting arrangements that are placed around the store. We also listened to some of the music played on boats on the canals that day; it was the Woodstock on Water festival. I attended Danja's high school graduation. I'm a proud big sister! She got good grades and an award for scoring best on the French exam. My attempts at groing eatable things didn't amount to much this year, but I did get to enjoy a couple of strawberries. I studied Project Management and Cultural Heritage. I decided to postpone Cultural Heritage, since despite my efforts, my progress with Project Management was too slow to get both classes done in time. We attended a group weekend near Leersum. Fun company, board games, a swimming pool, walks, pool (eight-ball), ice cream, sun... It was a nice little summer vacation in nice surroundings. On our way there Maarten, Bram and I visited Schoonhoven and the Zilvermuseum. On our way back we visited the Waterliniemuseum. I looked after poes Poes for a day and a night while Roeland was away. I went trough part of my stuff; stored some things more effectively, tossed a lot of paper clippings and brochures, and selected some things to send off to goodwill. I attended an evening with shows by students of the Paul van Vliet Academy. One of those students is my friend M.. It had been a while since I had been able to attend one of these shows and it was fun to see how the students had grown as artists! We visited the Muiderslot with Bram's family. It was a fun day out, with dinner at Van der Valk Avifauna afterwards. We attended a café-meet in Leiden. It had been a while since we were able to go. Maarten and I visited Hellevoetsluis. Bram and I went for a walk in the woods. Our first time playing Machi Koro with the harbour expansion set. JK, Maarten, Bram and I spent a day in 's-Hertogenbosch. Geralde and I met up in Rotterdam, where we visited the Fotomuseum. Bob, Bram and I visited natural history museum Naturalis in Leiden. Afterwards we had a small belated birthday celebration for Bob. Bram and I saw the sculpture exhibition along the Hooglandse Kerkgracht in Leiden. We had seen it with Bob in early June, but this time we spent a little more time exploring, during the daytime. We visited the Boeddha exhibition at Museum Volkenkunde (museum of ethnology). At the café at Museum Volkenkunde. Leuk, wat je allemaal hebt gedaan! Nicolette.